Building trust, and maintaining it, is part of the foundation of a healthy relationship. Think about some of the questions you ask yourself in your relationships. Are they really staying at work late, is she really meeting the girls for a night out, is he really only friends with her, why are they texting so much? Without trust you are really just a ball of insecurity and anxiety and questions. You have assessed the probabilities of gain and loss. You have calculated the hard data of loss versus benefit. You have concluded that the person in question will behave in a predictable manner. Why would you want to build trust in your relationship? Because, trusting is an act of vulnerability. Vulnerability strengthens emotional connection and deepens relationships. Here are some simple action steps to take in your relationships to start building trust. 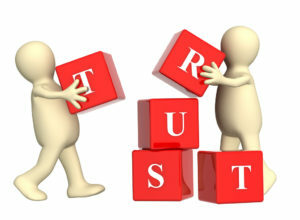 Building trust, and Maintaining Trust, doesn’t have to be a difficult task nor does it have to be a negatively emotional one either. These simple and actionable steps can help you start on a joyful pathway to trusting a new partner. Need help rebuilding trust once it’s been broken? Consider reading this article. Need a more guided plan of action or just some help in person? Consider a coaching session with Accelerated JoyWorks. JoyWork Suggestion: Make a habit of taking an actionable step each day and planning an activity every week. Let me know how you’re doing on the Accelerated JoyWorks Facebook page or in the comments below. 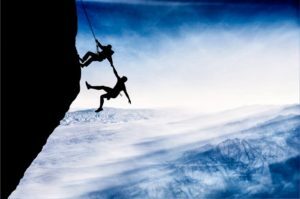 This entry was posted in Trust and tagged Building Trust, Coaching Goals, Communication, Connection, courage, Emotional Intimacy, Maintaining Trust, Relationships, Trust, vulnerability. Bookmark the permalink. Great topic that needs attention! Your list of trust building activities is super helpful and doable. Great! I’m so glad this has been helpful for you! Great post, it made me think about what I am doing to promote other’s trust in me, whether friend or spouse. Taking the initiative to start building trust in relationships and being committed to actions to keep that trust are well laid out in your writing. Thank you Lisa, I’m so glad you found the article helpful!